Today there won’t be any economic news in Canada to affect USDCAD and this pair will be under the influence of global macroeconomic news. However, the US had a negative consumer confidence report in April. USDCAD is falling down the descendant channel creating lower highs and as the EMA of 10 is below the EMA of 50 it shows the pair is moving in lower ranges in the last recent days. 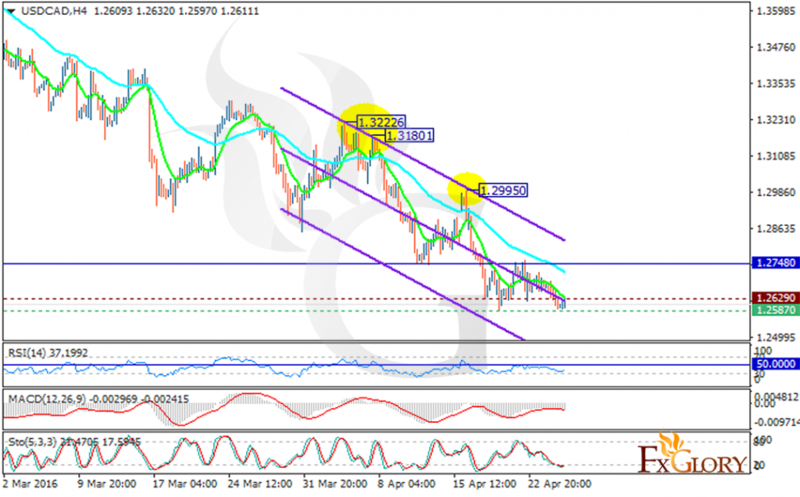 The support lies at 1.25870 with resistance at 1.26290 which both lines are below the weekly pivot point at 1.27480. All indicators are showing price decline as the RSI is below the 50 level, the stochastic is showing downward trend and the MACD is in negative territory. As long as the pair is moving below the pivot point it will continue its bearish pattern. Sellers can enjoy the fall for today.